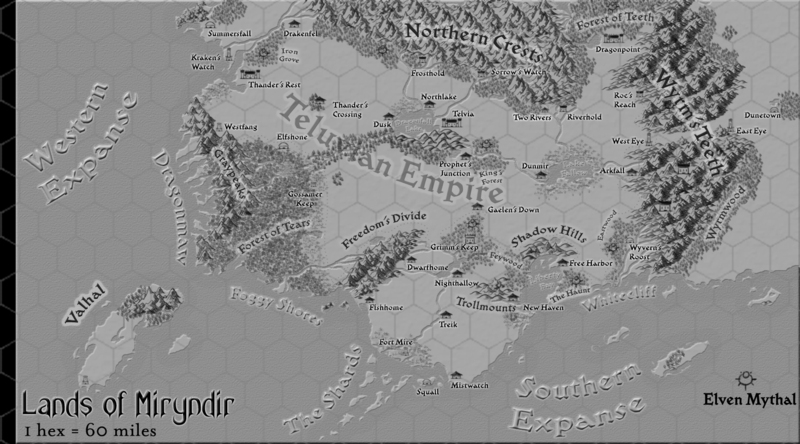 Dragons of Miryndir (pronounced MIR-in-dir) is a semi-monthly D&D game with a regular cast of players, set in a homebrew campaign setting created by Greg Bilsland. Games are typically played on Sunday afternoons (PST), and feature the same set of characters and NPCs from one session to another. 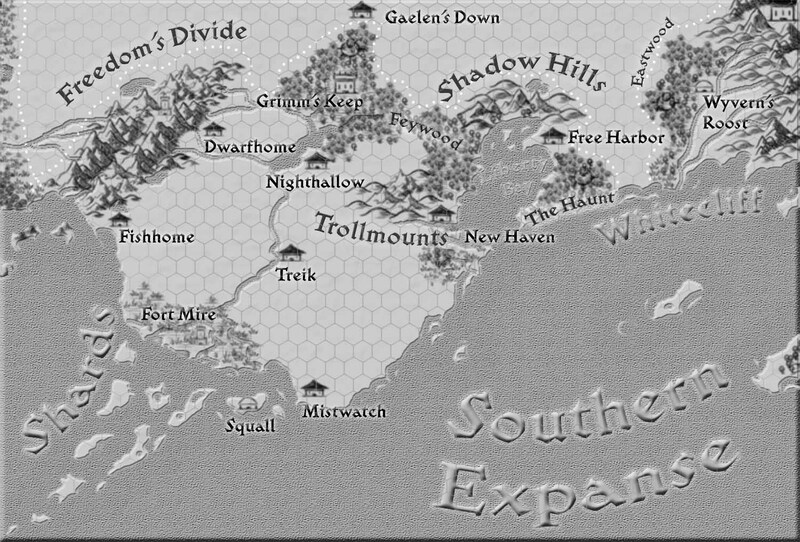 Below is an overview of the campaign setting. Dragons of Miryndir uses fifth edition Dungeons & Dragons. The calendar page has all the details on upcoming sessions. …with support from Kristi Riggin and Meris Mullaley. Of the twelve dragons, only one was gifted with the ability to create more of its kind. Falbolg took its scales and planted them in the land, and from the stone arose more dragons in the image of the Twelve. In time, these dragons grew greedy and became rulers, taking land and wealth. They dominated the First Races and exterminated those who opposed them. In this time, the world held none of the great forests and jungles of the present day, so the mortals had nowhere to find refuge. The world was still young, and the people did not know magic; they believed dragons immortal. Most paid homage to them as gods alongside the Brother and the Sister. And so, hoping for freedom, the people prayed to the Sister for refuge from the dragons. The Sister wept for how her creations had been corrupted, and her tears made the seeds grow taller and taller, until eventually they touched the sky. The people found refuge from the dragon overlords, for the dragons could not pass easily into the dense forests. Yet the people lived ever in fear of the dragons and the Twelve. This was a golden age for the dwarves and elves, who built great cities amid the forests and beneath the earth to escape the draconic reign. Yet humans were not content to cower in fear for an eternity. In time, the Sister saw how the humans longed to live out in the open sky, so she visited the world again. She gifted a young human warrior with three weapons: Icarus the Bow of the Sky, Ark the Sword of Insight, and Aegis the Shield of Earth. This human, Thander Teluvis, led people from the jungles, and in act of defiance, slew the Falbog, leader of the Twelve, so that no more dragons would ever be created. Six Disciples followed Thander into this battle, and these became the first clerics, gifted by the Sister with knowledge of true magic. They discovered the power that could be wrought from the essence of dragons, and soon the hunt began for more dragons that could be used to fuel miracles and spells of conquest. Thander Teluvis united the lands into the Teluvian Empire, and a religion was founded in his name. His six clerics went on to found the royal houses of his court. Worship of the dragons, once widespread, became taboo. Only worship of the Sister and Thander was permitted. The humans never forgot that war between the Sister and the Brother had produced dragons and an age of enslavement and suffering. And so it was that the Teluvian church forbade twins, propagating the idea that one twin would always be inherently evil. And indeed, history was littered with such examples. In the Teluvian Empire, the church now heavily monitors the rearing of children. Bearing more than two children is forbidden without special dispensation, and the church distributes a special herb called birthroot to maintain this system. Should a twin be born, the Teluvian church swiftly seizes the babe and disposes of it. During the Teluvian Expansion, following the defeat of the dragons, the other First Races diminished, retreating further to their respective corners of the world. The elves moved deeper into the Forest of Tears, where the Sister had first grown the trees tall to shelter her children. Although a few human friendly elven settlements remain within and surrounding Teluvian land, many of their kind live centuries without encountering a non-fey. Some dwarves integrated during the Teluvian Expansion, but many clans remained in their holds in the Wyrm’s Teeth, burrowing farther into the earth, determined to forget that humans, halflings, elves, or dragons ever existed. The halflings had no issue accepting human rule, since they made poor soldiers and found the protection of the Teluvian Empire welcoming. Those who chafed under the religious and birth edicts retreated to the south, where they inhabited islands and coastal villages, becoming some of the best seafarers of the world. Map by Mike Schley. ©Wizards of the Coast LLC. The following section provides guidelines beyond what is in the Playerís Handbook. Certain classes are tied to a specific race or region. Many of these will be evident from the racial descriptions below. A cleric or paladin, for example, is almost always associated with the Teluvian Church; the church isn’t picky about race, though non-humans are limited in terms of rank within the clergy. Paladins and clerics undergo special rites in the church that grant them their powers. A barbarian is almost always a human, though in rare exceptions an elf or halfling might make sense. Arcane magic exists across races, though it is more strongly associated with humans and elves. Other races can work as spellcasters, though. A halfling may have earned his or her a place on a ship with magical talents, or a dwarf gifted with druidic abilities may have fled his or her clan to avoid condemnation or shame. If you want to work out an exception, we can do so if thereís a good story concept. Please choose from the following races. Other races may be permitted as exceptions. Hill Dwarf (common). You are a dwarf of the human lands. You might be a native to the Teluvian Empire, where you craft finery for the Court of Roses or are embroiled in the politics of merchant guilds. You could be a soldier in the Teluvian army, which dwarves among their ranks for their battle prowess and sense of duty. Alternatively, you’re a trader, from the Free Coast to the south, where you guard or barter with the halflings and humans who live outside the empire’s rule. Perhaps you live in Dwarfhome, tending to the mines or smithing weapons in the great forges there. Mountain Dwarf (rare). You’re a member of one of the five original dwarf clans, which retreated deep into the Wyrmís Teeth or the Northern Crests centuries ago during the Teluvian Expansion. You might be an outcast, or an optimistic merchant looking to establish trade contacts with the outside. Chances are, whether you’re the lowest member of your clanís caste or among the highest ranking members, no one is happy with the fact that you’re exploring the Brightlands. Everything aboveground is a wonder to you; on the other hand, they are extremely primitive in other respects, having little concept of machinery and relying too heavily on magic, which your people compare to a drug. Among your people, magic is shunned with a few exceptions. Its use is heavily controlled and limited to only what cannot be achieved through industryóperhaps your fascination with it is why you left. High Elf (uncommon). You live in one of the scattered elven Mythals remaining in human lands. Your home is not as hostile to outsiders as the great forests of the west, but they are nonetheless isolated. As a high elf, you’re likely wary of the Teluvian Empire. Although it allows your people to operate as independent states within the Empire, the arrangement can be precarious. Your people regard the churchís history as incorrect, and its practice of fueling divine magic with dragon essence to be profane. In the interest of peace, though, your people donít interfere with the church’s proceedings. In return, the church overlooks the fact that your people pay homage to many ancient creatures and deities beyond just the Sister and Thander. Have you remained sheltered your entire life, venturing out for the first time, or have you traveled and traded frequently with outsiders? Were you drawn away after showing a penchant for arcane magic, which brought into human lands to become a cleric, paladin, or wizard? Are you one of the elven performers or bards, renowned among the Court of Roses? Or could it be curiosity with the human practice of writing down history, which the elves abandoned long ago in favor of song? Wood Elf (rare). Wood elves are scarcely seen by anyone except the fey folk. These isolationist elves live almost entirely within the Forest of Tears, where they subsist in the perilous environment despite numerous predators and deadly plantlife. As a wood elf, your exposure to the outside world has been limited, and you find anything beyond life in the jungle to be like a dream. Were you a foundling, raised from an early age among the high elves of the mythals or among humans in the empire, or did some halfling trader find you abandoned along one of the rivers leading into the jungle? Did you leave willingly, or were you an outcast, called upon by some greater cause? Among the wood elves, everyone hunts and everyone gathers—no one has a defined role in society. Were you frustrated by your inability to pursue the magic inherent in your blood, or to understand the songs passed down through the ages? Or did you crave to explore the ancient elven ruins, which lay buried deep in the jungle, forbidden to all. If so, what brought you to the eastóthe search for other adventurers, or knowledge of bygone days? Stout Halfling (common). 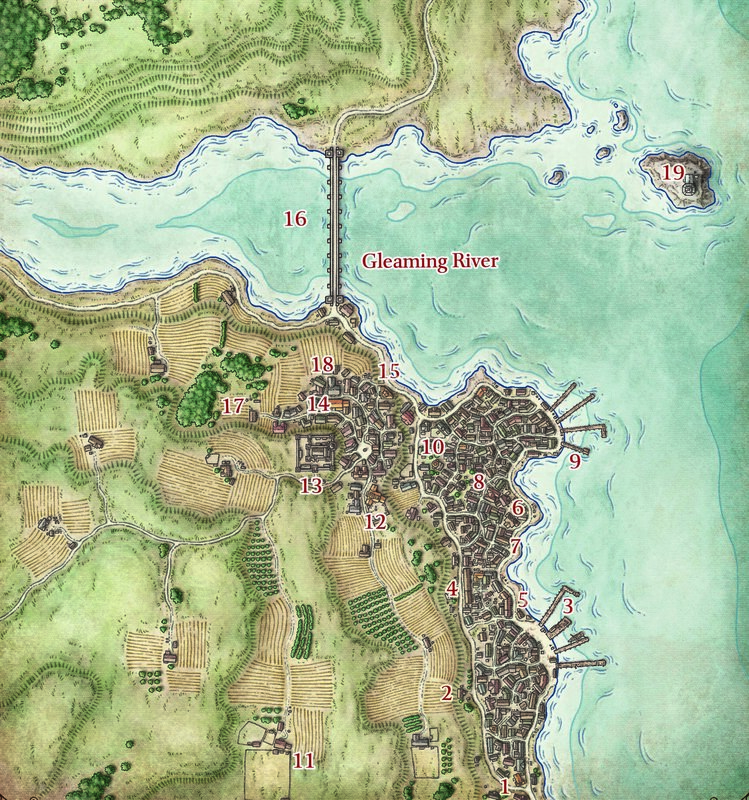 Stout halflings ply the rivers and oceans, fishing, salvaging, and trading the wares of humans. The Free Coast, a loose confederation of states to the south of the Teluvian Empire, primarily comprises their home. As a stout halfling, you are more inclined toward adventure than your lightfoot kin. Have you journeyed on the open ocean, mapping The Shards and The Foggy Shores in search of dragons, or do you work with representatives of the dwarven clans to discover treasures long forgotten in the depths of the ocean? With a predisposition for adventure, stout halfling are constantly establishing new trading outposts and small settlements, creating new trade routes and discovering remote tribes with whom to trade. Are you an aspiring explorer, intent on leaving your mark upon the world, or are you trying to uncover the ancient roads and tradeways long since forgotten. Humans are the dominant population of the world, but they come in all forms. Although most humans are citizens of the Teluvian Empire, many who live in those lands reject its politics or are content to live oblivious to the broader political struggles. Those who chafe under imperial rule often move to the peripheries of society, retreat to the Free Coast or living in isolated villages at the edge of the empire. The following descriptions cover some basics about humans and describe some of the more unusual options among humankind. Imperialist (common). As a Teluvian human, you could be from just about any strata of society, from lowly farmer up to a member of the Court of Roses. If you’re a member of one of the six High Houses by birth, what has taken you away from the capitol, Telvia? Are you working in secrecy to uncover some political plot, or are you outcast? Perhaps you abandoned your house to pursue adventure and escape court intrigues or an inheritance you reject? The larger cities in the Teluvian Empire brim with ancient maps, dusty tomes, and rumors of lost ruinsóperhaps one such secret caught your attention, and sent you abroad looking for answers. Intrigue abounds beyond the capitol. You could be connected to The Network, a wide-reaching crime syndicate ruled by bosses that works in loose cells toward the profit of all. If so, are you trying to escape their wrath for some real or imagined crime, or are you working toward a nefarious goal that extends all the way to the upper echelons of the organization. Whether nobility or a commoner, you could have a background in the Church, which is just as rife with intrigue and politics as the Court of Roses. The Church accepts all devotees, providing for food and lodging in exchange for a lifetime of service. They donít take kindly on runaways or those who shirk their obligation. Did you flee the church, or are you still an active devotee, sent on a secret holy mission by the Grand Theist and his advisors. Or perhaps you’re a monk or holy warrior, following in the tradition of Thander, intent on the destruction of the evils that still inhabit the world. You might even be an inspiring dragonslayer, who hopes to carve a name by killing one of the Twelveís offspring and harnessing the power for the good of the clergy. Separatist (common). Separatist is a term used generally to refer to those living outside the empire or those within the empire who oppose its rule. Separatists exist in many stripes, but primarily represent people of the Free Coast who dwell on the peripheries of the empire, where geography or past political strife has loosened imperial rule. Most notably are the lands to the south, which comprise a loose confederacy of merchant-states along the coast. Here, the humans live peaceably, primarily alongside halflings and hill dwarves, trading with the empire and each other. The nomadic Dunefolk dwell far to the east, undisturbed by the empire due to the harsh climes in which they subsist. The Hinterfolk of the Northern Crests and the Wyrmís Teeth live in small pockets across the mountains, their populations limited by available resources. These people are monster hunters, trading the skins and carcasses of creatures theyíve felled. The Hinterfolk have often served the empire as trackers and rangers, identifying the location of dragons and other beasts that are hunted for profit or pleasure. I like this setting, it has a very “Dragon Age” / “Elderscrolls” feel to it. The description of dragon-kind raises some questions though, from the description, it doesn’t sound like there is much difference between the alignment-options of dragons. They also sound basically like evil beings. I particularly caught on to the Elven-Gods thing, which is why I think this feels so much like Dragon Age. It feels similar in the way that the dominating religion happens to be the only religion without any real evidence behind it, while all the minor religions all seem to reflect some degree of truth.